Figure 7-2. - American standard reinforcing bar marks. Figure 7-3. - Expanded or diamond mesh steel reinforcement. 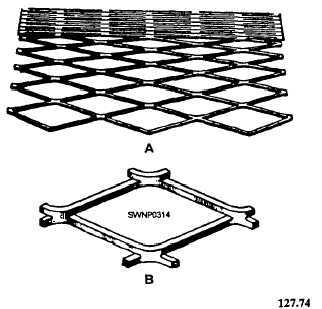 concrete pads that do not have to bear substantial weight, such as transformer and air-conditioner pads. Four numbers are use-d to designate the style of wire mesh; for example, 6 by 6-8 by 8 (sometimes written 6 x 6 x 8 x 8 or 6 x 6 - W 2.1 x W 2.1). The first number (in this case, 6) indicates the lengthwise spacing of the wire in inches; the second number (in this case, 6) indicates the crosswise spacing of the wire in inches; the last two numbers (8 by 8) indicate the size of the wire on the Washburn and Moen gauge. More recently the last two numbers are a W number that indicates the size of the cross-sectional area in the wire in hundredths of an inch. (See table 7-4.) WWF is currently available within the Navy stock system using the four-digit system, 6 by 6-8 by 8, as of this writing, but if procured through civilian sources, the W system is used.